In our many years of experience at Clark Construction as kitchen remodelers, we've learned that it's not too many cooks that spoil the broth. The problem is a kitchen design that doesn't accommodate multiple cooks! Cooking has become more than a necessity. It's an experience. From gourmet chef to fanatical foodie, people are more passionate about preparing and enjoying meals. No longer is a woman alone in the kitchen. Couples are partnering in food preparation. 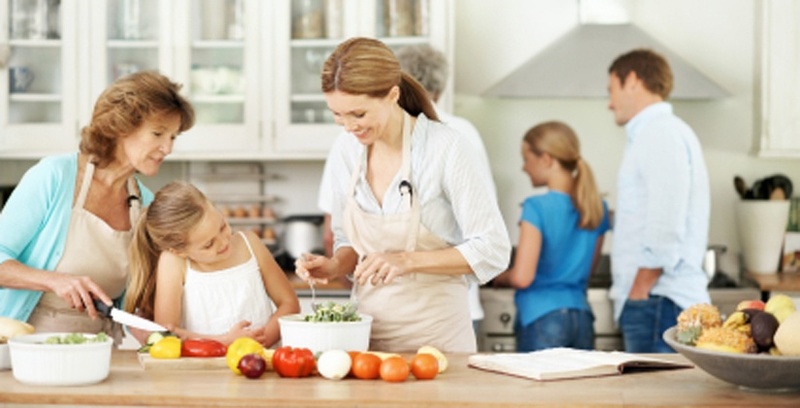 Families make cooking a group activity, where all ages get involved. And dinner parties often include guests joining in the fun of contributing their cooking skills to the feast. To avoid messy collisions and temper flares that run hotter than the stovetop, you might need to rethink the layout of your kitchen if you want to happily share the space. Kitchen design isn't merely just about replacing cabinets and appliances. There's a strategy to remodeling a kitchen for better efficiency as well as more pleasing décor. Your kitchen will be used by every household member, so the space should work for everyone. When you have multiple cooks using the kitchen, you create very specific needs to be met with the kitchen redesign. 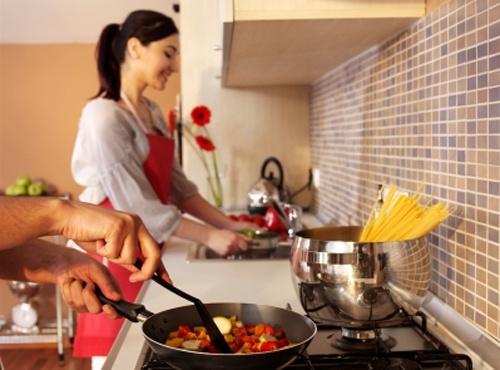 Do you switch cooking chores or does each person usually handle the same task? Does one cook handles the food preparation—rinsing, chopping, and measuring—while the other works the stove? Do you have one person who primarily does the baking? Is one person the chef while the other is the assistant? Are you cooking with children? It's important to understand these variations because the way you use your kitchen together creates different traffic patterns and different space needs. Traditional kitchen design focused on the efficiency of the work triangle, a three-point pathway from food prep to cooking to clean-up. This layout works well for one cook, but when there are multiple cooks in the kitchen at one time, everyone's work triangles can overlap and cause bottlenecks. Alternately, if you look at your kitchen as a collection of zones, you can assign areas to specific tasks. You still need the prep, cooking, and cleanup zones, but you might also define separate zones for baking, beverage prep, and eating. A pantry could be your storage zone. A zoned design is a good idea when you have multiple cooks, because you can arrange the spaces to allow for better flow, efficiency, and fewer collisions. When my husband and I cook together, we fight over the measuring spoons. Two sets would be a good step forward! If you have multiple cooks and both a large space and budget, you can certainly expand your kitchen design to allow for two refrigerators, two cooktops (e.g., gas and induction), two wall ovens, a prep sink and a cleanup sink. You might even want to add a second dishwasher—maybe installing a single-drawer dishwasher as the second one. An L-shape kitchen design with an island is a popular choice. The island adds a 360-degree workspace and can incorporate its own sink, oven, and cooktop, if desired. You can install a pot hanger above the island for easy access and to save valuable cabinet space for other utensils. Install two faucets, one on each side, rather than one behind the sink in the traditional location. That way, the sink can be used from both sides at once, and allows you to comfortably fit two cooks in one kitchen . Finally, have enough room to move around in your kitchen to optimize productivity. You should allow 48 to 54 inches of space between obstacles (e.g., between the island and stove), the minimal amount for two people to be able to pass one another. Sixty to 64 inches is ideal for walking rather than squeezing past each other, which is of particular importance when one cook is handling something hot! If your current kitchen simply isn't working for you, talk to us at Clark Construction about remodeling. We can help you create a multi-cook kitchen that will let you enjoy sharing your space.